A tenuous pact has kept some of the most powerful League at bay since the end of the Beacon Wars. Is this about to end? Is war, returning to the land? Escalation is the word of the day. Since the end of the Beacon Wars, a tenuous pact has kept some of the most powerful Leagues at bay. On one side, we have the coalition; on the other we have the Knights Templar and their allies. In recent days, this pact has come under question. The spark? One member that has joined Destiny, known as Roftie, a seasoned and experienced fighter and a long-term enemy of the Knights Templar. 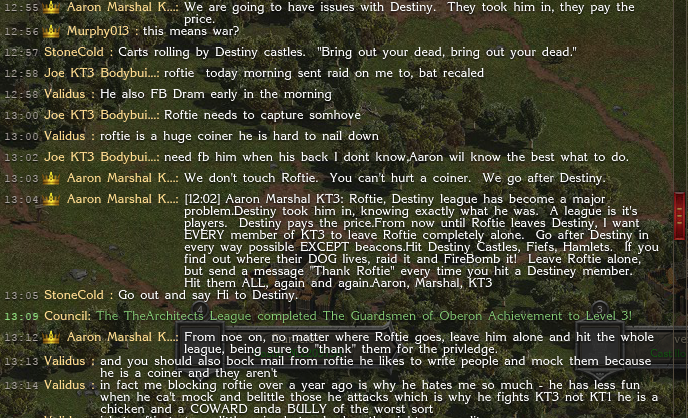 Shortly after leaving the Unforgiven family where he previously presided, Roftie began a systematic campaign of raiding member after member of the Knights Templar 3 League. 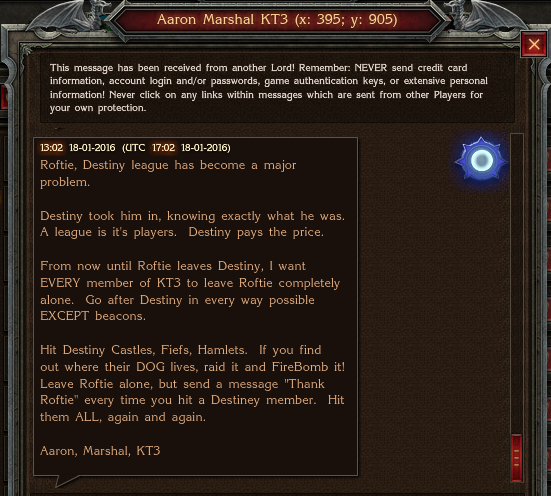 The fact that Roftie was doing this under the Destiny banner infuriated the leadership in KT3 and resulted in an escalation of arms by their membership. Attacks against the powerful Roftie proved to be fruitless; this only further infuriated those within KT3 and resulted in the following message being issued by their leadership. The frustration from KT3's Aaron can be felt strongly through these written words. After this message, of which Destiny quickly gained knowledge, a discussion began amongst their ranks. 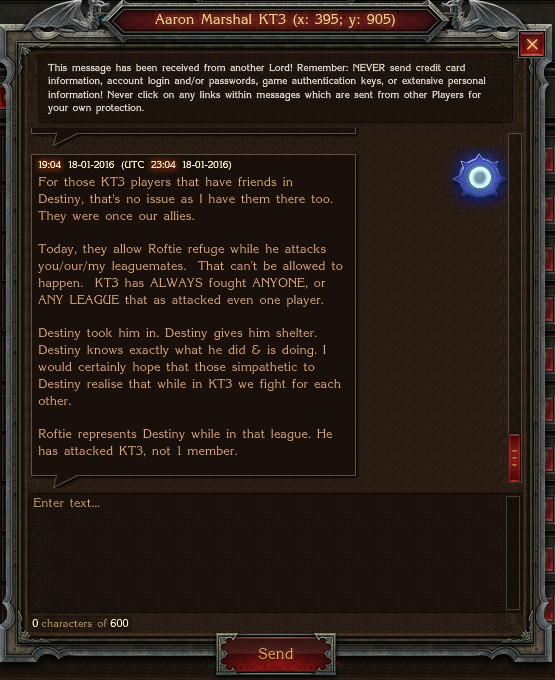 The majority of them decided to support Roftie and a series of attacks were issued back towards the ranks of KT3, who were already raiding and invoking dark sorcery on members of Destiny. Aaron issued a number of messages following this escalation, explaining to his ranks why these attacks would continue and assuring his forces that they would be supported by the rest of the Knights Templar family, a fact that was not yet apparent, but would be necessary if they were to have any hope of winning. Later that evening, a Captains’ meeting was held amongst the ranks of the Knights Templar family, where the conversation switched back and forth between supporting KT3 or holding their tenuous pact in place with Destiny. Ultimately, it has become apparent, much to the displeasure of Aaron, that a full-out war on Destiny at this time would not be desirable, as the cost on both sides would be massive. Yet, as history has shown, the Knights Templar have ways of dealing with enemies, predominantly through through affiliate Leagues and those they consider allies. Only time will tell if this conflict will flare again or if it has been laid to rest. Until then, be safe, citizens of Stormfall, and tune in next week.